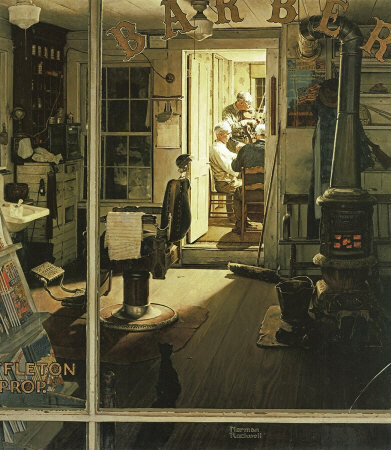 Shuffleton's Barbershop, a Norman Rockwell painting , appeared on the cover of The Saturday Evening Post published April 29, 1950. This is another favorite of Rockwell collectors, a classic enduring image of the world Rockwell painted. This painting was Rockwell's 263rd overall out of 322 total paintings that were published on the cover of the Saturday Evening Post. Rockwell's career with the Post spanned 47 years, from his first cover illustration, Boy With Baby Carriage in 1916 to his last, Portrait of John F. Kennedy, in 1963. This was also the first cover for The Post in 1950. In 1950, there were four Norman Rockwell Saturday Evening Post covers published. The original oil on canvas painting, 46.25 x 43 inches or 117.5 x 109 cm, is part of the collection of the Berkshire Museum. on page 185 of Norman Rockwell, A Definitive Catalogue by Laurie Norton Moffatt. A study also appears on page 186 of the Norman Rockwell Catalogue. Shuffleton's Barbershop is one of the most recognizable Norman Rockwell paintings. It is also one of my favorites. The details captured in this painting are incredible. Starting in the foreground, we can see the exterior window of the barbershop. We can see the paint and the putty peelimg on the window. There is a crack in the pane. Looking inside, we see a rich rendering of the shop's interior. Some of the interior details that catch my eye are the comic book stand, the barber chair, theAmerican flag on a poster and the red hot coals in the wood burning stove. Looking even farther back to the rear of the shop, we can observe Shuffleton and his cohorts playing music. We do not know how often they get together to practice and play. Their only audience tonight is a siingle cat. Shuffleton's Barbershop was only one of 322 Norman Rockwell Saturday Evening Post covers; Here is the list of Norman Rockwell Saturday Evening Post cover illustrations. All of the light in this composition comes from the back room. Yet is still comes off as a very warm painting, despite the scene being portrayed occuring at night. Rockwell used light and dark masterfully in this painting. Do You Have A Great Story, Opinion Or Contribution About Shuffleton's Barbershop?